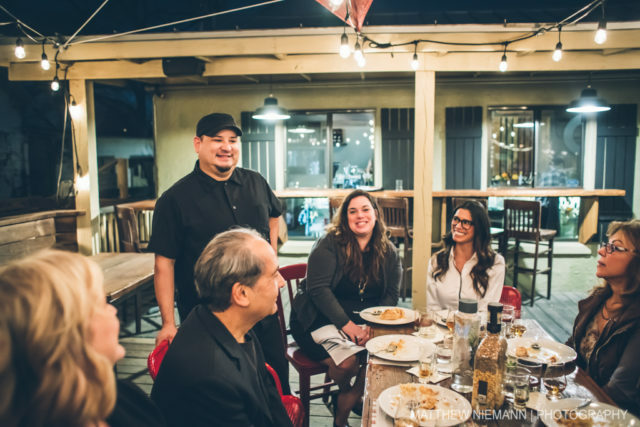 Every year I look forward to the San Antonio Cocktail Conference paired dinner series—it’s the best kept secret of the entire event. While there’s incredible food paired with thoughtful off menu cocktails, the interaction with brand ambassadors, chefs and other cocktail enthusiasts in such a small space is amazing. 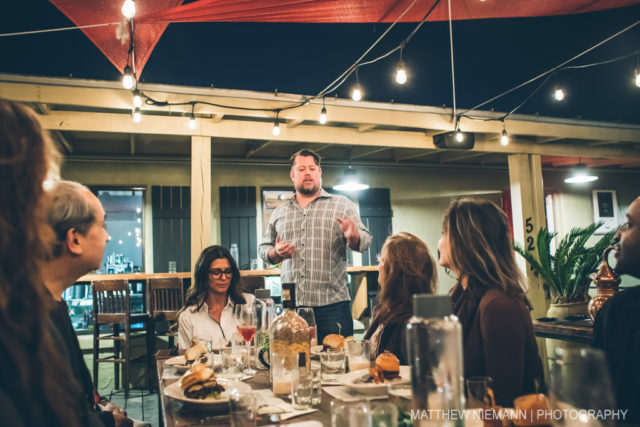 And this year’s Woodford Reserve dinner at Grayze was even more remarkable because of our spring-like weather in the middle of January: the mild night meant that we were treated to patio seating for the dinner! The meal opened with a light and fruity whiskey berry spritzer as we got to mingle with our hosts and guests. I’m kind of curious if they would have opened with this drink had it been a gloomy January night, but the drink fit perfectly with our wonderful weather. Woodford Reserve berry spritzer to open the evening. Photo by Matthew Niemann. Typically, these kinds of four-course events start with a salad to open the meal with a lighter second course before the main dish. But that was not the case at Grayze—these guys brought it. All. Night. Long. No one would leave hungry. 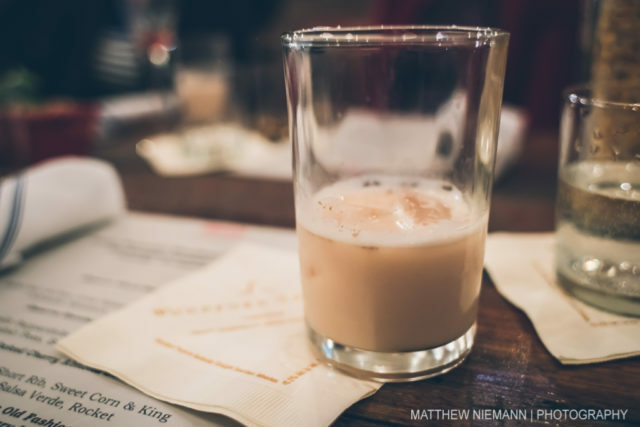 The first course was a milk punch made with Woodford Reserve Distiller’s Select and horchata. It was creamy with nice cinnamon flavors—this was the cocktail meant for winter weather. Even my photographer Matthew Nieman—who is not an horchata fan—thought that the drink was exceptional. Horchata milk punch. Photo by Matthew Niemann. This stout cocktail was paired with an equally full-flavored (and personal favorite) first course: a Kobe beef and foie gras slider that was served with a small side of truffled potato chips in a porcini Brie spread. 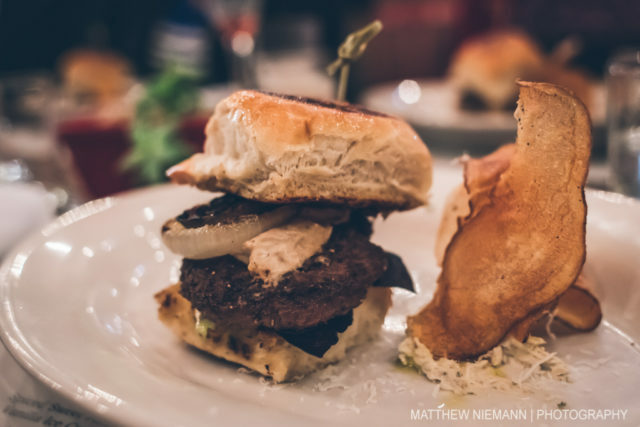 Favorite course of the evening: Kobe burger with foie gras. Photo by Matthew Niemann. 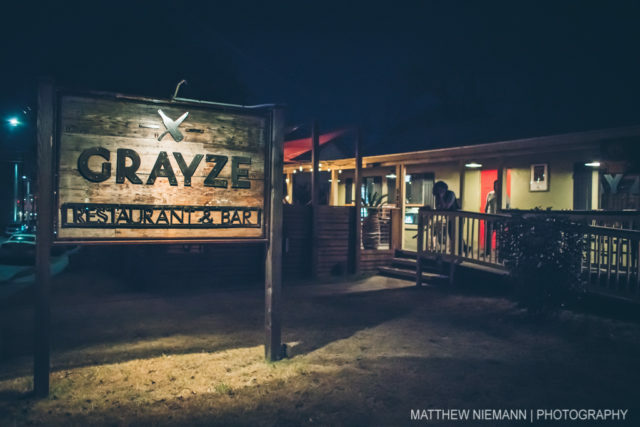 James Moore, owner of Grayze, told us that for the first course they “went with decadence and richness, all the way 100%.” The only thing that he said was missing from the first course to put it over the top was caviar. And this was just the FIRST COURSE PEOPLE! Grayze owner James Moore. Photo by Matthew Niemann. Next up was a cherry almond sour made with Woodford Reserve Double Oaked whiskey. It was very tart—the cherry flavor reminded me of the cherry cider from the Ruidoso and Cloudcroft, NM area—and paired well with the rich flavor of the duck papperadelle (“rich” was a theme all night!). I was a fan of the slice of toast with Boucheron cheese finding a new favorite cheese to get at the store. Cherry sour with duck papperadelle. Photo by Matthew Niemann. 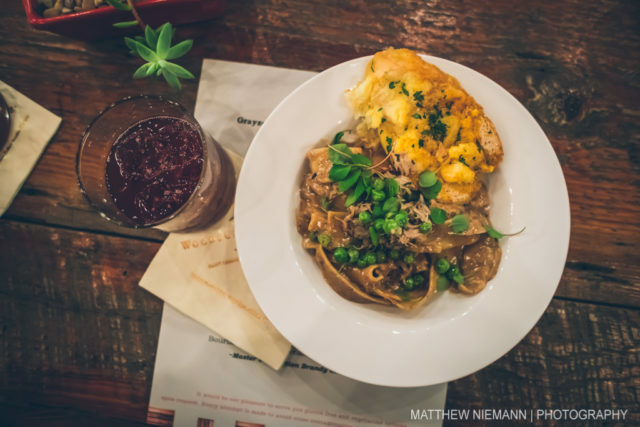 The third course put us over the top—a braised beef short rib served on a piece of cornbread. It was topped with a salsa verde that worked well with meat. But the cocktail, a rye old fashioned with an ice cube made of frozen watermelon and rosemary puree, was a miss in my eyes. This was the only misstep of the evening, but it was atoned by the fact that we got to drink some of the Woodford Reserve Rye straight. 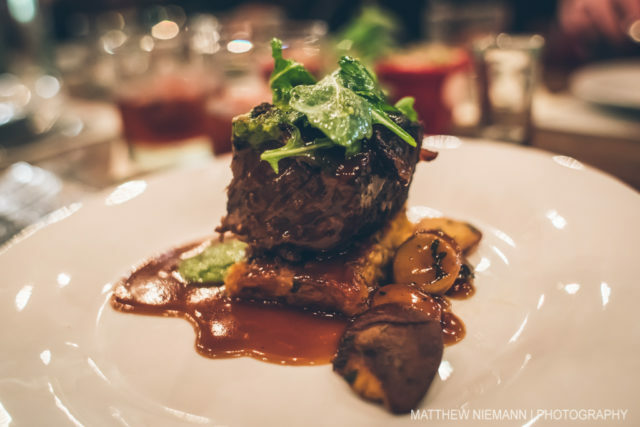 This beef short rib put me over the top. Photo by Matthew Niemann. Our dessert was a flakey pineapple empanada with a little bit of heat from a jalapeño that was quelled by a scoop of ice cream. 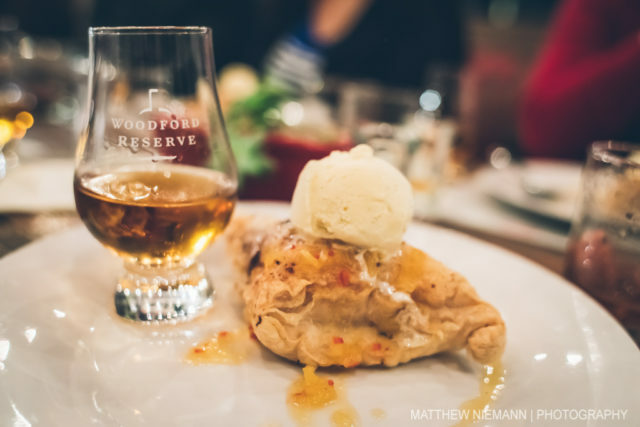 It was paired with a snifter of Woodford Reserve Master’s Collection Brandy Cask Finish whiskey. But to be honest, at this point in time I was so full to really enjoy it. One thing is for certain, I’ll be returning to Grayze in the near future. Great way to end a meal! Photo by Matthew Niemann. 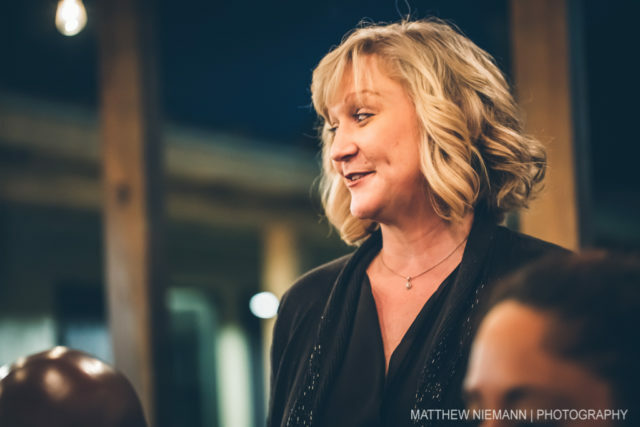 Ashley Bible, the on-premise marketing manager with Brown-Forman (the company that owns Woodford Reserve), was very informative throughout the evening and a fantastic hostess. She told us that the Woodford Reserve Distiller’s Select takes six to eight years to fully mature and that there are actually professional tasters—not computers—that tell when a barrel is ready. Hostess Ashley Bible of Brown-Forman was incredibly insightful. Photo by Matthew Niemann. Walking into Grayze. Photo by Matthew Niemann. Bible also noted that the Woodford Reserve distillery is one of the few bourbon distillers that has their own cooperage (“When you’re at the cooperage and they have that flame [going] you can stand within 35 feet of that [fire] and it’s just in your face!) and that at five to seven days, their fermentation process is also a little longer than most distilleries. “We choose to keep it longer so that way we are taking on a lot more floral notes, the citrus notes and then we’re not stressing out the yeast,” Bible added. This was a perfect paired dinner to start my 2017 Cocktail Conference!!! 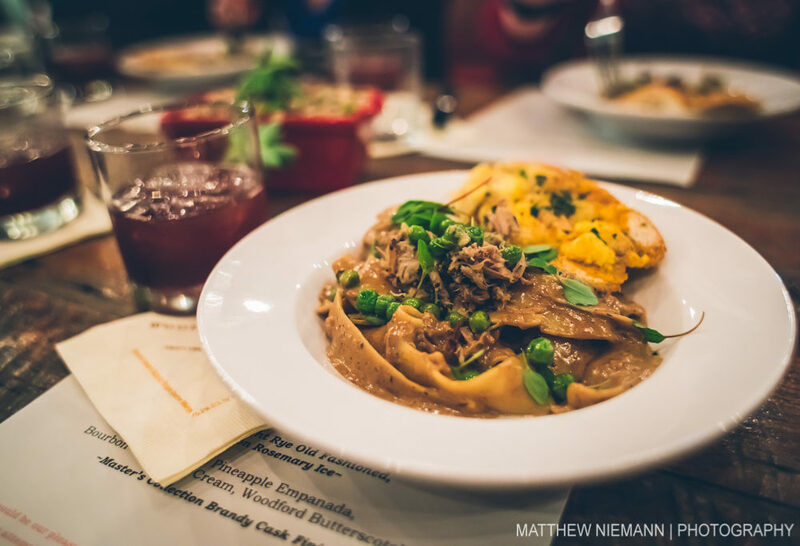 You can still buy tickets to the last paired dinner tonight at Biga on the Banks with Glenlivet (I had an awesome experience at a Biga paired dinner in 2014). Grayze chef Pedro Cuellar brought it this evening! Photo by Matthew Niemann. I’d recommend bookmarking their Schedule webpage to be in the know for next year. 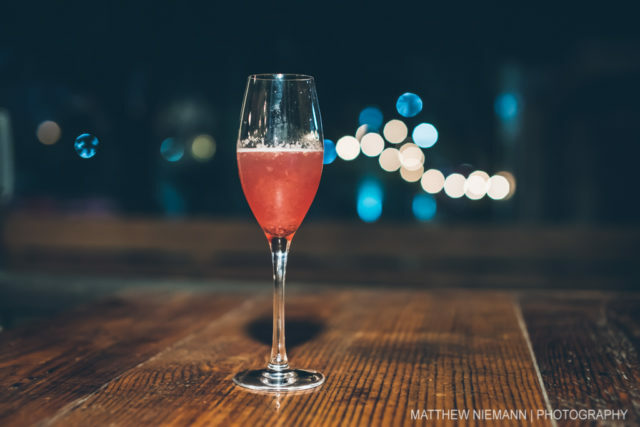 Also, be sure to check out all the SA Flavor coverage of the Cocktail Conference from this year and year’s past. Cheers San Antonio! 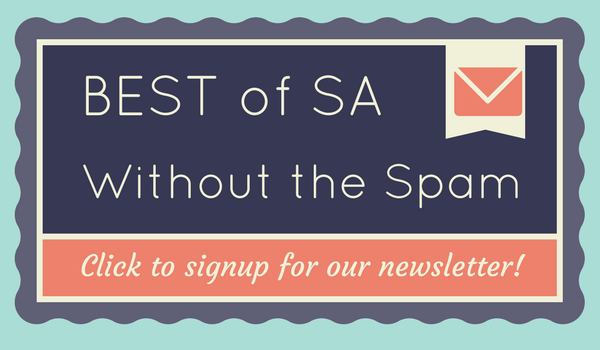 Sign up for the SA Flavor Newsletter for all the best of SA without the spam! And be sure to shop the SA Flavor Store for the best Fiesta Medals, stickers, shirts and more! Living in San Antonio since 2005, Garrett enjoys going around town looking for the perfect enchiladas.